a. 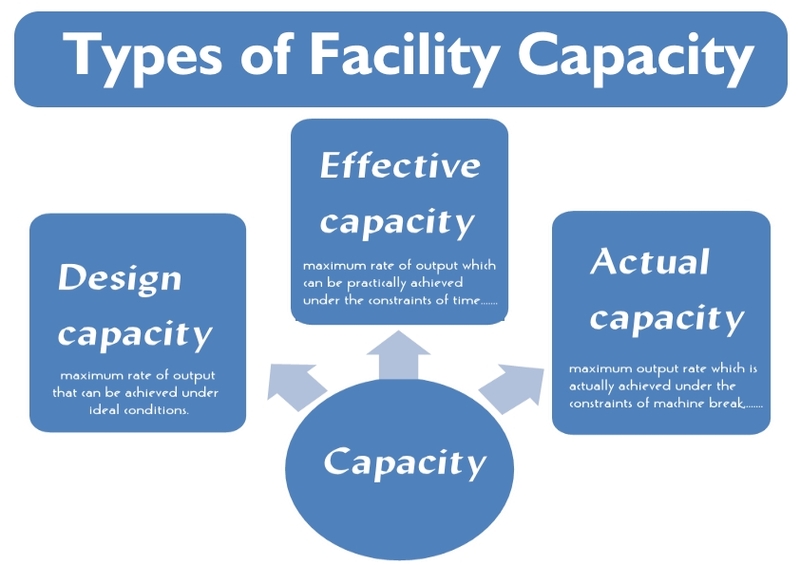 Design capacity -It represents the maximum rate of output that can be achieved under ideal conditions. b. Effective capacity - It is the maximum rate of output which can be practically achieved under the constraints of time consumed in set-ups, oiling & cleaning, defective items, etc. Effective capacity is always lesser than the design capacity. 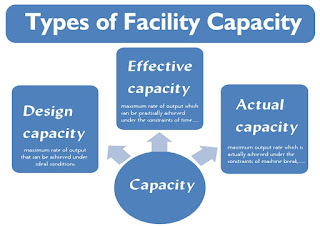 c. Actual capacity- It is the maximum output rate which is actually achieved under the constraints of machine breakdowns, labor inefficiencies & absenteeism, defective products, late deliveries of materials by the supplier, and so on. Actual capacity can be equal to or less than the effective capacity. • During one week of production, a plant produced 83 units of a product. Its historic highest or best utilization recorded was 120 units per week. What is this plant’s capacity utilization rate?